Use the side entrance to the left and behind the main entrance. From 9D, turn left onto Main St. and follow it down to Rock St. 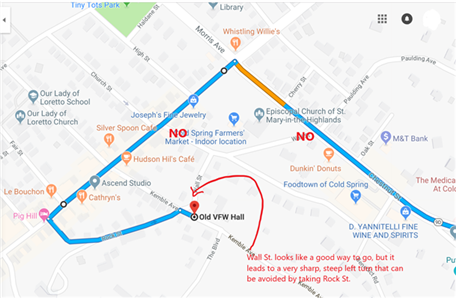 Turn left onto Rock St., then make a right onto Kemble Ave. Please follow the parking guidance here (can also be found on the door of the Old VFW Hall.). If you choose to take Wall St. to Kemble, be advised that there is a sharp, steep, narrow left turn onto Kemble. Copyright © 2019 Music Together with Alexia. All rights reserved.